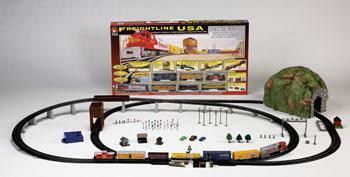 This is a Freightline USA Sante Fe Model Train Set HO Scale from Life-Like Trains. Retail $241.99 SAVE 24% ! Also includes Power-Loc track, the unique side-locking track system that clicks together instantly and locks track securely in place. Theres no need for rail joiners, so set-up is quick and easy. Solid roadbed base offers durability and support on any surface (even carpet), eliminating the need for boards, nails, screws or tools. Sets also include a UL-listed power pack with forward and reverse, and a terminal rerailer. This top-of-the-line train set includes a GP38-2 diesel loco, 6 freight cars, 49 x 76" double loop Power-Loc Track, 2 manual switches, 18 piece bridge and pier set, coal tipple, gravel dump station, operating dual crossing gate, 3 shanty kits, 3 vehicles, 6 figures, 3 trees, tunnel, signal bridge, 24 authentic street signs, 6 utility signs and more.